two peas & the dog: food. 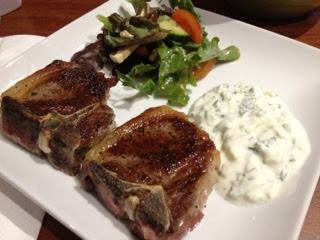 lamb, homemade tzatziki. Of course we are going to have lamb as a staple on our menu. We live in Australia! That's a silly question. Nate was in charge of the lamb. Super easy...salt, pepper, olive oil. BBQ. Only turn once. I was in charge of tzatziki. Options were to buy a ready made dip (or sauce, whatever you want to call it) or to make one from scratch. Epicurious called my name on this one. It turned out pretty good. I went a bit overboard with the garlic though. Good thing Nate and I are married. 1. Shredded cucumbers go in a bowl, add a few pinches of salt. Let sit for about 15 minutes to let the excess water drain from the cucumbers. 2. In another bowl, mix together the rest of the ingredients. 3. Add the cucumber (without the water). 4. Add more salt and pepper as needed.